Tuesday, October 16, 2018 11:00a – Noon ET Global Health Corps recruits “applicants with diverse skill sets to work with high-impact organizations in year-long paid positions.” They offer 130+ fellowship roles within organizations on the front lines of global health in Malawi, Rwanda, Uganda, the U.S., and Zambia. Applications open in December, but the preview is now live here. Please register by October 15 at http://goo.gl/forms/rXmSPoljJi . 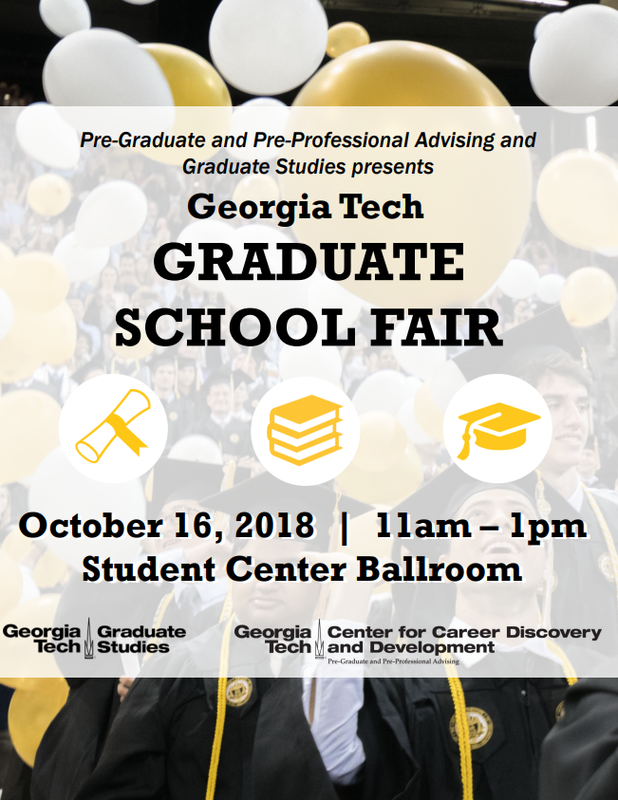 Come check out the 2018 Graduate School Fair, Tuesday, October 16, 11:00-1:00, in the Student Center Ballroom. There will be more than 60 programs from Georgia Tech and around the nation. Learn more about the fair and the participating graduate programs at: http://career.gatech.edu/graduate-school-fair.